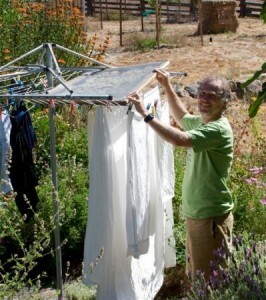 Tim shows his method for drying apple rings in the hot California sun. For his recently released book, Cooking for Geeks, author Jeff Potter interviewed prominent researchers, food scientists, knife experts, chefs, writers, and more, including author Harold McGee, TV personality Adam Savage, and chemist Hervé This. Some provided recipes, others offered tips and tricks, and each brought his or her own geeky insights into the space where science and cooking meet. In one case, the contribution was a comic (by Randall Munroe of xkcd). As you can imagine, while preparing the book, Jeff had access to a geek whose name is eponymous with the company that published his book. The excerpt from Cooking for Geeks that follows includes part of their conversation, along with the recipe for Tim’s now-famous homemade scones. Jeff: You say you don’t consider yourself a foodie at all? Tim: No. In fact, I kind of make a small number of things that I make repetitively. A lot of what I do is driven by the fact that I hate to waste things. 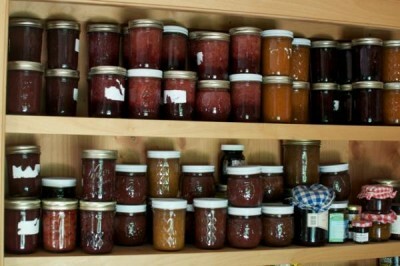 So hence jam because there’s all this great fruit. [Tim has numerous fruit trees.] Right now I’m doing dried apples. But let me put these scones in. 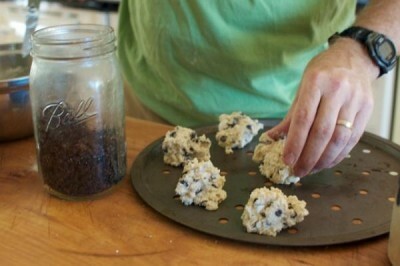 [Tim had been making scones as we started.] This is something that I figured out a long time ago. I make this big batch and it’s too much for two people so I made a batch and then I was like, oh wait, I can just freeze it. Jeff: How did the thought of freezing it come to you? Tim: Oh, I don’t know, it was just sort of like duh. It’s sort of like so obvious. You just make it and freeze it and then I have it and I can throw in a bunch. When somebody visits it literally just takes me a few minutes. The raspberry jam—I have raspberries, but I don’t have enough to make jam all at once, but I’ll go out and pick them every day and now you can see what I’ve now got… [Tim holds up a bag of frozen raspberries.] By the time I get two of these bags I’ll have enough to make raspberry jam. You don’t have to do it all at once. Jeff: What’s your favorite kitchen tool? Tim: I like things that seem magical. When you see this particular apple peeler-corer-slicer, you’ll go, “Oh! That’s so cool! It’s magical.” It just does a fantastic job. Use a low-methoxyl pectin, such as Pomona’s Universal Pectin. Unlike standard pectin, which requires sugar to create a gel, Pomona’s is activated by calcium. This basically takes one variable out of the picture, in the sense that you don’t have to add sugar for both taste and stability, but just for taste. Throw some spoons in the freezer before you start. When making the jam, drip the hot jam onto the cold spoon to let it cool, and then you can tell whether it has a good gel or not. With these two points in mind, you’re totally free to experiment with flavor, because that’s the only variable left to optimize. Using a pastry blender or two knives, cut the butter into the flour. When done, the butter and flour should look like small pebbles or peas. Stir with a knife until you get just shy of a gooey consistency. Start with only ½ cup (130g) of milk, adding more as necessary until the dough begins to hang together. If it gets very sticky, you’ve put in a bit too much milk. You could add more flour if you’ve gone in with less flour to begin with. It’s better to bake them sticky than to add more than a total of three cups of flour: the stickiness is just a problem for shaping them, since it sticks too much to your fingers; too much flour, and they can become tough. Prepare a baking sheet by lining it with parchment paper or a Silpat (nonstick silicone baking mat). If you don’t have either, lightly grease a baking sheet. (You can just rub it with the paper from the stick of butter.) Using your hands, shape the dough into small lumps spaced evenly on the baking sheet. Bake at 425°F / 220°C until the tops are browned, about 10 to 12 minutes. Serve with jam, and, if you’re feeling piggy, with Devonshire cream (whipped cream works, too, from one of those aerosol cans, so you can just put a spot of it on). You can use a cheese grater to grate the butter into the flour. Chill the butter for a few minutes so it’s easier to handle. Tim freezes the partially mixed dough, adding the milk and currants to the dough after it’s pulled out from the freezer. (The frozen dough has an almost sand-like consistency, so you can pull out as much or as little as you want.) The benefit of the frozen dough is that you can bake scones a few at a time, adding just enough milk to bring the cold dough to a sticky consistency. This makes for a great quick treat, especially if you are the type that has unexpected guests occasionally. It’s also in the spirit of learning to cook like a pro: nothing goes to waste this way, and it’s efficient! P.S. 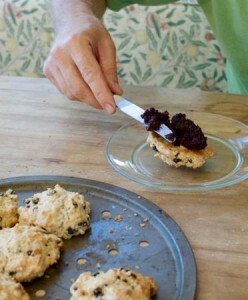 Instead of trying to cut the scone in half to butter and jam it, just flip it over and use the bottom! Next Next post: The D.I.Y. Book Tour — Where should I go? ?